This gleaming estate showcases a magnificent display of modern sophistication paired with impeccable design. Enter through the gate to be welcomed by a bright and radiant open floor plan, filled with an abundance of natural light, high ceilings, and oversized electric sliding doors that allow seamless entry and exit to the backyard. This stately property boasts five en-suite bedrooms, all of which have a private balcony and walk-in closets, six bathrooms, a movie theater, fitness room, office, and spacious loft with balcony access. The right wing of the home encompasses the dining area and italian kitchen that offers calcutta quartz counters, breakfast area, wine wall, and a remarkable view of the resort style backyard – a perfect compliment to your morning coffee. Make your way to the upper level that encompasses the master suite and four en-suite bedrooms. The master bedroom boasts two walk-in closets, vanity, and a spa-like bathroom that exudes the finest finishes. The entertainer’s backyard is built for the LA lifestyle, offering a luminous pool & Jacuzzi, two covered sitting areas, built in BBQ with a refrigerator and counter seating, and an abundance of space for your pets to enjoy the summer. Located near the prestigious Lanai Elementary school, this brilliant home is your family’s new paradise. 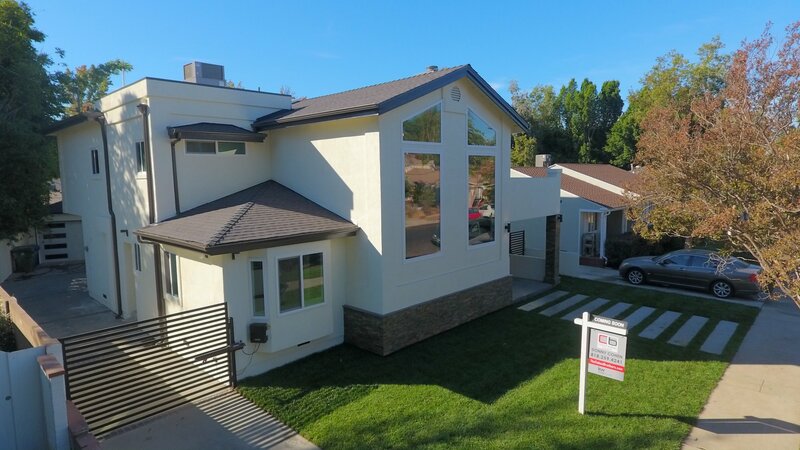 Welcome to this Spacious and beautiful traditional style home Located in the desirable Chandler Estates area of Sherman Oaks and within Dixie Canyon School District. 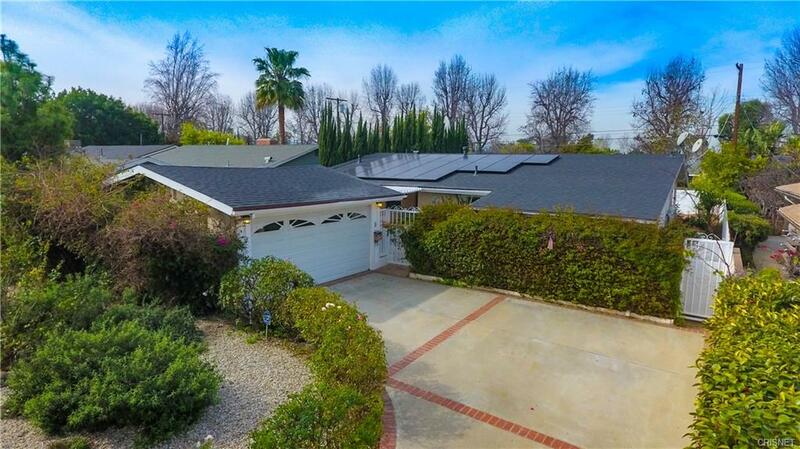 This property features a solar panel roofing system that has been paid off, drought resistance landscaping, central A/C and heating, and hardwood floors and recessed lighting throughout. The kitchen includes granite counter-tops, stainless-steel appliances, and a breakfast nook. The dining area is just off the kitchen and is open to the living room with fireplace, walls of windows, and a door that leads to the private backyard, with sparkling pool and covered patio perfect for all your entertaining needs. Plus, a spacious family room with another door that leads to the backyard. All bedrooms include ceiling fans. Enjoy the breezeway between your home and the garage and the quiet neighborhood that is close to shops, schools, and restaurants. This home is a must see! Located in the coveted Fashion Square area of Sherman Oaks. This remodeled one-story home Features 3 Bedrooms, 2 bath & 1,794 sqft. Enter to a stylish and cozy living room with wood burning fireplace with Carrara marble tile, crown molding, hardwood floors and ample recess lighting throughout. Just off the living room enter to an elegant formal dining room. New kitchen complete with subway tile back-splash, quartz counter-tops, New stainless steel appliances, Dishwasher, breakfast bar, hardwood floor and custom built in wood and glass cabinets for fine china. Relaxing family room with French doors that lead to a covered patio and private backyard. Master Bedroom with crown molding, large walk in closet, Ceiling Fan and French doors that lead to the private backyard and features many ficus trees. Master Bathroom features standalone shower and New free-standing tub, New wall mount vanity cabinet with fitted dual sinks, and features a small glass block window for light and privacy. All 3 bedrooms feature walk in closets and ceiling fans. New 2nd Bath features vanity cabinet with fitted sink, a tub shower combo that is tiled throughout. This home also includes a Laundry room, Security system with 6 cameras with motion sensors, Front and Back Sprinkler System, and tank-less water heater and automated gate. Within proximity to the Fashion Square Mall, Trader Joe’s, Restaurants, & Cafes. Located in the Chandler Learning Academy Elementary and Robert A. Millikan Middle School. This gorgeous 5 Bed, 4 Bath, 3,600 SQFT (approx.) home is sure to take your breath away. This incredible open floor plan is perfect for entertaining, with a large open living and kitchen space that has a spectacular view of the backyard; a space that you, your family, and friends are sure to love. The kitchen is home to a pantry room with shelves, all new Viking Appliances, bar seating at the center island, and a quartz counter top waterfall, as well as custom backsplash tiling. Upstairs boasts a custom bookshelf and entertainment console that is the perfect place to unwind at the end of the day. The incredible Master Suite has a large walk-in closet, bathtub, and a wall-to-wall shower with custom tile work. The entertainer’s backyard is home to a slated deck area and a re-plastered pool. 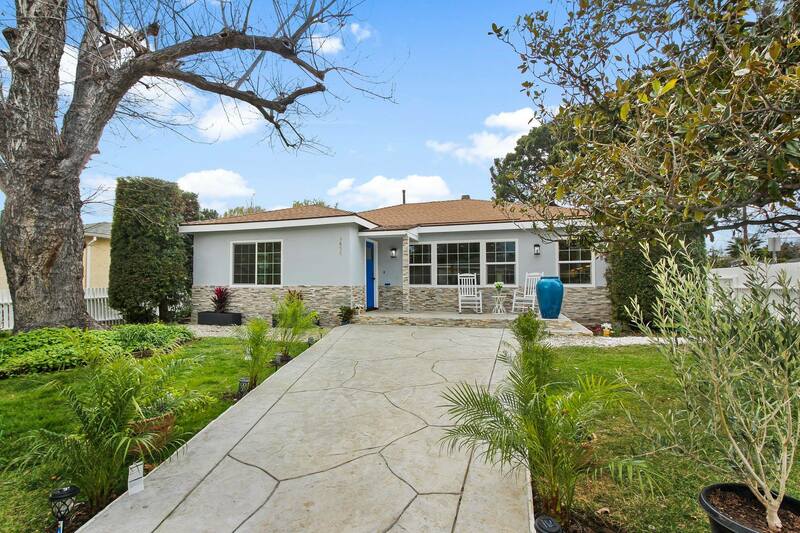 Located on a sprawling corner lot in a desirable Sherman Oaks area and Award winning Kester Elementary School district. As you enter the property, enjoy the beautiful stamped concrete that leads you to the front porch and stack stone entrance. This fully remodeled home offers upscale living in a comfortable setting. The 3 bedroom 2 bath home features an airy open concept floor plan that transitions effortlessly to exterior spaces creating an atmosphere perfect for entertaining. Common rooms include an open living room concept with a fireplace, a designated wall to display your favorite wines, family room with beamed ceilings with an additional fireplace, gourmet center island kitchen with quartz counter tops, stainless steel Samsung appliances, waterfall ledge breakfast bar, custom cabinetry and recessed lighting throughout. An attractive master suite features a walk-in closet and bath with dual sinks, large tiled shower with glass doors and French doors that lead you to a stamped concrete deck. The second bath has a tub with tiled walls. The backyard includes a lattice covered patio area with tiled floors and a large grass area, great for children’s play yard. This property is located within close proximity of the 101 and 405 freeways, grocery store, coffee house, and many eateries.